If you have ever fished the Olympic Peninsula, or dream of fishing it, now is the time to speak up. The Washington Department of Fish and Wildlife is taking input on proposed rule changes that will impact steelhead and steelhead fishing on the famed Olympic Peninsula. Deadline for comments is NOVEMBER 12th. The recommendations on rule changes were compiled by the North Coast Steelhead Advisory Group. The group, comprised of 13 people with deep and diverse knowledge of the fishery (one of which WSU’s own John McMillan), was established to gather information about how to best manage the winter steelhead sport fishery. While not everyone agreed on the same approach, they all agreed on the fact that both fisheries need to be improved to rebuild wild steelhead. The North Coast Steelhead Advisory Group’s recommendations are an important step forward in that regard. We at Trout Unlimited and Wild Steelheaders United ask that anglers get involved in the upcoming management process by providing written comments and testimony in support of several new rules that are being proposed. 1. 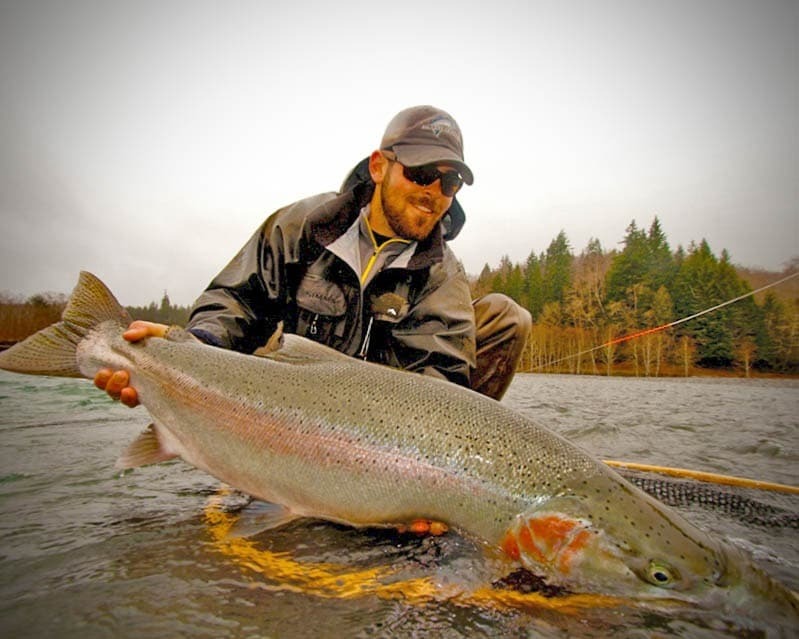 First and foremost, ask WDFW to implement wild steelhead and rainbow trout catch-and-release. Releasing wild steelhead and rainbow trout will put more fish on the spawning grounds, which is critical to rebuilding wild steelhead populations on the OP. Provide support for this rule (#48) by asking WDFW to require catch-and-release for all wild steelhead and rainbow trout on the OP rivers. 2. Second, ask WDFW to implement restrictive gear regulations during the winter steelhead season. Barbed hooks are more difficult to remove and create larger wounds than barbless hooks. Extended and poor handling reduces the chances of a fish surviving to spawn. Bait is the most effective method and partly as a result, we are catching – not including fish hooked and lost – more than the entire escapement in the Sol Duc and close to it in the Bogachiel and Hoh Rivers. Prohibiting bait will is therefore likely to reduce chances that we catch the entire run while simultaneously spreading use of a limited resource across a greater number of anglers. Bait is also more likely to result in mortality of post-spawn fish (kelts) that are feeding as they migrate back to the ocean after spawning, and it produces substantially higher encounter and mortality rates with juvenile steelhead and smolts, which is not trivial considering the thousands of anglers that fish the OP every year. The Advisory Group recommended that barbed hooks and bait be prohibited from December 1 to April 31 except during those times and places where hatchery fish are commonly present (December 1 – February 15 in Lower Bogachiel and Calawah Rivers). The problem is that early-timed wild steelhead are also present during the hatchery steelhead season and rebuilding the early-timed component of the run is critical to recovery. Further, because they do enter early, they are in the fishery for a longer period of time. As a result, early-timed steelhead are more likely to be caught multiple times by anglers, leading to greater chances of mortality. Therefore, we request selective gear regulations be implemented across the entire winter steelhead season. Do this by commenting on Rule #47, which proposes selective gear restrictions only during the summer, and specifically stating that you support selective gear fisheries during the entire winter steelhead season from December 1 to April 31 in the Sol Duc, Calawah, Bogachiel, and Hoh Rivers, in addition to the short stretch of the Queets River between the tribal reservation and the Olympic National Park. In addition to the above rules, the North Coast Advisory Committee proposed prohibiting the use of motorized boats on OP rivers. Please provide support for this rule under Rule #47 by asking WDFW to prohibit the use of motorized boats on the OP. 3. Third, ask WDFW to experiment with a “no fishing from floating device” rule in the upper Hoh River. The vast majority of steelhead on the OP are caught by anglers in boats and the advent of rafts – both large and small – and improved fishing techniques means that there are very few places where steelhead cannot be caught by anglers. While anglers could not fish from a boat in this reach of the Hoh under the proposed rule, they could still use boats for transportation. Restrictions on boat fishing are likely to become increasingly necessary if angling pressure continues to mount and steelhead runs continue to decline. The short reach in the Upper Hoh provides an opportunity to experiment with the rule and see how anglers respond. Ask WDFW to support Rule #46 by specifically suggesting that they institute a no fishing from boat rule from Olympic National Park boundary downstream to the WDFW boat launch at Morgan’s Crossing in the upper Hoh River. Make your comments heard by the Washington Fish and Wildlife Commission. For an opportunity to give public testimony on these rule proposals, be sure to attend the WDFW Commission Meeting on November 14 at 8 a.m.